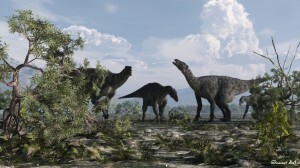 “Using both traditional and new computational approaches, we were able to place the new species within the family tree of sauropod dinosaurs and determine both its uniqueness as a species and to delineate others species with which it is most closely related,” said lead author Eric Gorscak, a doctoral student in biological sciences at Ohio University. The dinosaur’s bones exhibit similarities with another titanosaurian, Malawisaurus dixeyi, previously recovered in Malawi. But the two southern African dinosaurs are distinctly different from one another, and, most notably, from titanosaurians known from northern Africa, said co-author Patrick O’Connor, a professor of anatomy in the Ohio University Heritage College of Osteopathic Medicine. n addition to providing new data about species evolution in sub-Saharan Africa, the study also contributes to fleshing out the global portrait of titanosaurians, which lived in habitats across the globe through the end of the Cretaceous Period. Their rise in diversity came in the wake of the decline of another group of sauropods, the diplodocoids, which include the dinosaur Apatosaurus, the researchers noted. Scientists have found fossils for more than 30 titanosaurians in South America compared to just four in Africa.